Getting someone to click on your call to action is what counts in email. But you will never get the click unless someone opens your email first. The top 4 items on our Email QA checklist focus exclusively on getting someone to open your email. You can have incredible email engagement too. 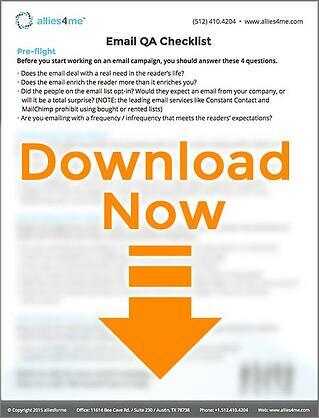 Download our own checklist and start seeing results on your next email campaign. Are you enticing people to open your emails? If they don't open your email, they certainly won't click on your call-to-action. You should answer these four questions before launching an email campaign. You don't need a crystal ball to know how users will respond to future campaigns. But if you ignore these steps, your mailing list will become less and less valuable. Do you know how long you have to convince readers to read your full email? Use these strategic steps to ensure your email is read - and more importantly, clicked. 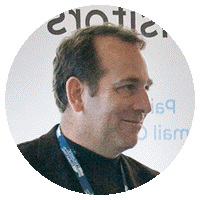 "This is our starting point for every email campaign. Focusing on fundamentals has given us a solid track record that keeps our campaign performance at the top of the industry." Download this checklist and put these principles to work for you.